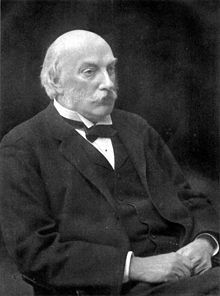 John William Strutt, 3rd Baron Rayleigh, OM, PC, PRS (/ˈreɪli/; 12 November 1842 – 30 June 1919), was a British scientist who made extensive contributions to both theoretical and experimental physics. He spent all of his academic career at the University of Cambridge. Among many honours, he received the 1904 Nobel Prize in Physics "for his investigations of the densities of the most important gases and for his discovery of argon in connection with these studies." He served as President of the Royal Society from 1905 to 1908 and as Chancellor of the University of Cambridge from 1908 to 1919. Rayleigh provided the first theoretical treatment of the elastic scattering of light by particles much smaller than the light's wavelength, a phenomenon now known as "Rayleigh scattering", which notably explains why the sky is blue. He studied and described transverse surface waves in solids, now known as "Rayleigh waves". He contributed extensively to fluid dynamics, with concepts such as the Rayleigh number (a dimensionless number associated with natural convection), Rayleigh flow, the Rayleigh–Taylor instability, and Rayleigh's criterion for the stability of Taylor–Couette flow. He also formulated the circulation theory of aerodynamic lift. In optics, Rayleigh proposed a well known criterion for angular resolution. His derivation of the Rayleigh–Jeans law for classical black-body radiation later played an important role in birth of quantum mechanics (see Ultraviolet catastrophe). Rayleigh's textbook The Theory of Sound (1877) is still used today by acousticians and engineers. Strutt was born on 12 November 1842 at Langford Grove in Maldon, Essex. In his early years he suffered from frailty and poor health. He attended Eton College and Harrow School (each for only a short period), before going on to the University of Cambridge in 1861 where he studied mathematics at Trinity College, Cambridge. He obtained a Bachelor of Arts degree (Senior Wrangler and 1st Smith's Prize) in 1865, and a Master of Arts in 1868. He was subsequently elected to a Fellowship of Trinity. He held the post until his marriage to Evelyn Balfour, daughter of James Maitland Balfour, in 1871. He had three sons with her. In 1873, on the death of his father, John Strutt, 2nd Baron Rayleigh, he inherited the Barony of Rayleigh. He was the second Cavendish Professor of Physics at the University of Cambridge (following James Clerk Maxwell), from 1879 to 1884. He first described dynamic soaring by seabirds in 1883, in the British journal Nature. From 1887 to 1905 he was Professor of Natural Philosophy at the Royal Institution. Around the year 1900 Rayleigh developed the duplex (combination of two) theory of human sound localisation using two binaural cues, interaural phase difference (IPD) and interaural level difference (ILD) (based on analysis of a spherical head with no external pinnae). The theory posits that we use two primary cues for sound lateralisation, using the difference in the phases of sinusoidal components of the sound and the difference in amplitude (level) between the two ears. In 1919, Rayleigh served as President of the Society for Psychical Research. As an advocate that simplicity and theory be part of the scientific method, Rayleigh argued for the principle of similitude. Rayleigh was elected Fellow of the Royal Society on 12 June 1873, and served as president of the Royal Society from 1905 to 1908. From time to time Rayleigh participated in the House of Lords; however, he spoke up only if politics attempted to become involved in science. He died on 30 June 1919, in Witham, Essex. He was succeeded, as the 4th Lord Rayleigh, by his son Robert John Strutt, another well-known physicist. Lord Rayleigh was buried in the graveyard of All Saints' Church in Terling in Essex. The rayl unit of acoustic impedance is named after him. When I was bringing out my Scientific Papers I proposed a motto from the Psalms, "The Works of the Lord are great, sought out of all them that have pleasure therein." The Secretary to the Press suggested with many apologies that the reader might suppose that I was the Lord. Still, he had his wish and the quotation was printed in the five-volume collection of scientific papers. I have never thought the materialist view possible, and I look to a power beyond what we see, and to a life in which we may at least hope to take part. What is more, I think that Christ and indeed other spiritually gifted men see further and truer than I do, and I wish to follow them as far as I can. He held an interest in parapsychology and was an early member of the Society for Psychical Research (SPR). He was not convinced of spiritualism but remained open to the possibility of supernatural phenomena. Rayleigh was the president of the SPR in 1919. He gave a presidential address in the year of his death but did not come to any definite conclusions. Lord Rayleigh was among the original recipients of the Order of Merit (OM) in the 1902 Coronation Honours list published on 26 June 1902, and received the order from King Edward VII at Buckingham Palace on 8 August 1902. He received the degree of Doctor mathematicae (honoris causa) from the Royal Frederick University on 6 September 1902, when they celebrated the centennial of the birth of mathematician Niels Henrik Abel. Sir William Ramsay, his co-worker in the investigation to discover Argon described Rayleigh as "the greatest man alive" while speaking to Lady Ramsay during his last illness. H. M. Hyndmann said of Rayleigh that "no man ever showed less consciousness of great genius". Rayl, a unit of specific acoustic impedance. ^ "Sketch of Lord Rayleigh". The Popular Science Monthly. Bonnier Corporation. 25 (46): 840 ff. October 1884. ^ a b c "Lord Rayleigh: The Nobel Prize in Physics 1904". The Nobel Foundation. 1904. Retrieved 5 May 2010. ^ "Strutt, the Hon. John William (STRT861JW)". A Cambridge Alumni Database. University of Cambridge. ^ "Past Presidents". Society for Psychical Research. Archived from the original on 23 February 2015. Retrieved 19 November 2014. ^ Lord Rayleigh (Robert John Strutt), John William Strutt Baron Rayleigh (1964). "An Appraisal of Rayleigh", Air Force Cambridge Research Laboratories, Office of Aerospace Research, U.S. Air Force. p. 1150. ^ JPL (2008). "JPL Small-Body Database Browser: 22740 Rayleigh (1998 SX146)". NASA. Retrieved 23 July 2008. ^ a b Gavin, Sir William (1967). Ninety Years of Family Farming. Hutchinson of London. p. 24. O'Connor, John J.; Robertson, Edmund F., "John William Strutt, 3rd Baron Rayleigh", MacTutor History of Mathematics archive, University of St Andrews . This page is based on the Wikipedia article John William Strutt, 3rd Baron Rayleigh; it is used under the Creative Commons Attribution-ShareAlike 3.0 Unported License (CC-BY-SA). You may redistribute it, verbatim or modified, providing that you comply with the terms of the CC-BY-SA.